Over the years we’ve received many emails inquiring about bilingual, specifically Spanish language, storytime resources. Though I grew up in California and took over four years of Spanish in high school I don’t program in Spanish in my current job. But that doesn’t stop the librarian in me from wanting to do the research! I’ve compiled all of the websites, books, and songs I could find on this topic. If you know of something I missed, please leave a comment so I can add it in! I view this post as a living document that will constantly be updated as new resources become available. Looking for languages other than Spanish? Dana wrote a guide to Multilingual Storytimes. All of the webinars listed here are free. Bilingual Storytime: What Is It? How Do I Do It? Will Anyone Come? Bilingual Storytime Resources: Holly wrote a blog post with a bunch of different resources, including her own storytime plans. You can also see her songs and rhymes. 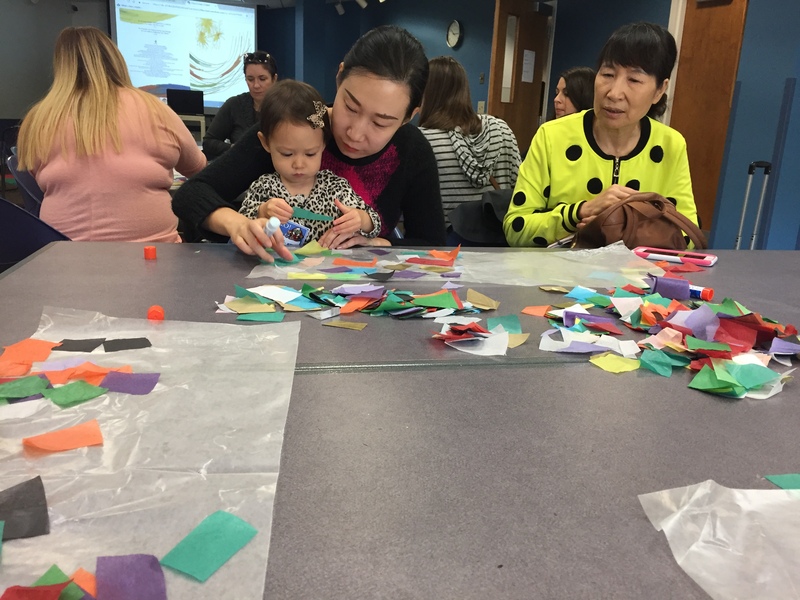 Please feel free to leave a comment with advice, tips, or resources related to running a bilingual storytime program! If you know of resources for bilingual storytimes in languages other than Spanish and English let me know and I’ll create a separate section at the end of the post for those. 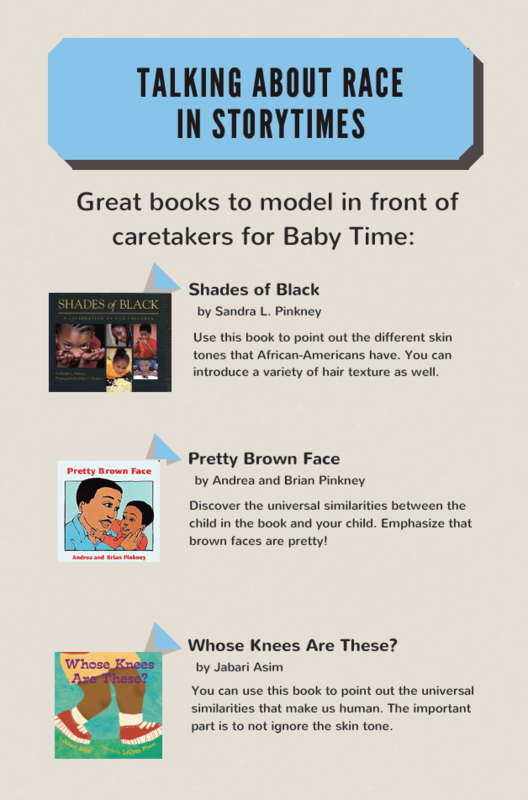 Today’s guest post continues a conversation about talking to kids about race in storytime that I began to ponder last year. My initial post, Talking to Kids About Race, was followed by a guest post sharing racially diverse storytime booklists. This guest post by Jessica Bratt delves deeper into the topic of talking to kids about race in a storytime setting. 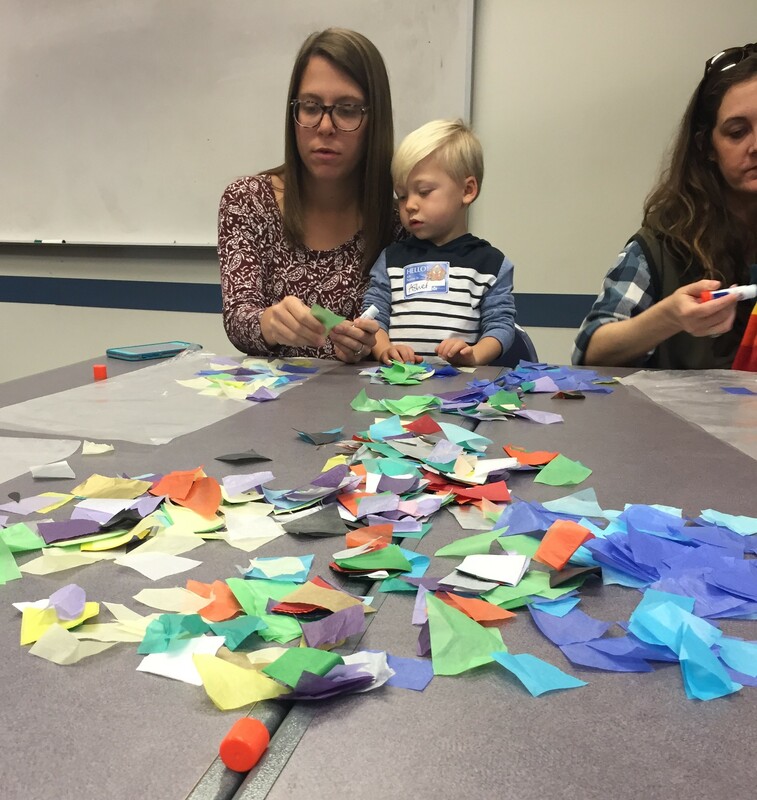 Jessica shares her personal journey relating to this topic and shares a toolkit she created for library staff who do storytime. Take it away, Jessica! I attended the 2018 Partners for a Racism-Free Community forum entitled, Standing at the Intersections. 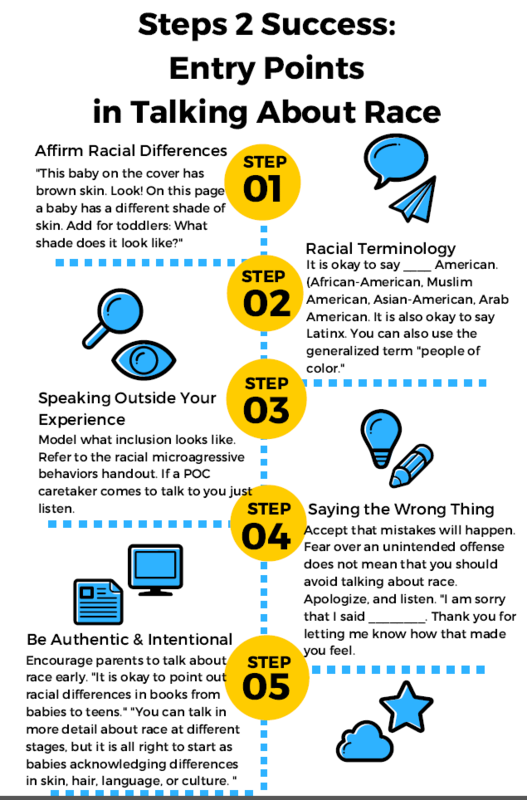 This forum talked about racial equity and inclusion that intersects with a person’s identity. Charlene Carruthers, their keynote speaker, talked about the work she has done with BYP100, her upcoming book, and how we could take part in seeing the world as it should be. Her Q&A session resonated with me because her responses were absolutely poignant in understanding the work early literacy/youth services librarians have towards inclusion in storytimes. What are my self interests? Who am I accountable to? What am I best positioned to do? Another attendee followed up with a question of how do you get kids to intersect with others from all walks of life to have conversations about social justice terms: power, privilege, access, oppression, etc? Her response was that you create child-friendly components of whatever work you are doing and make a space to invite both groups into the room. That self-work was how the Let’s Talk About Race series developed. It provides a child-friendly space to address inclusion and diversity to make space for everyone in the room. I saw talking about race as part of the self work that I needed to do (that we all should be doing). In part because who I am is integral to my profession. As an African-American librarian, I am a descendant of slaves and can trace back my history to 1796 when my great-great-great grandmother was born a slave in South Carolina, her father was sold when she was a baby and then she was sold to the Liddell plantation. As a professional librarian, I am also a Youth Services Manager and it is my responsibility to help prepare children with the tools they need to be successful. That is how I settled on creating the Let’s Talk About Race toolkit. I wholeheartedly believe that the celebration of diversity and inclusion starts at birth. I am accountable to my community, to the future generations if I do try to do my best in providing tools to disrupt biases creating a world where kids can recognize, accept, and celebrate differences. One of my favorite books is Old Turtle and the Broken Truth by Douglas Wood because ‘you are loved and so are they’ is a world truth that has been fractured, distorted, rebranded and coded into divisive messages that one group is always better than others. A co-worker, Jeanne Clemo, an amazing early literacy instructor, brought into one of our library’s early literacy committee meetings the Jbrary post on talking about race. She talked about how the post made her think about what we could be doing more in our storytimes for inclusion and diversity. We had conversations about what that could look like which enabled me to sit down and create a toolkit. I realized that through our conversations talking about race, which seemed natural to me in my storytime programming others had a hard time opening up to the possibilities partially because there were no guides or blueprints developed. In a profession that is 88% white how could I create tools necessary to make something that is natural for me empowering for others? How do I teach others to talk about race especially if it was something that they never had to do before? 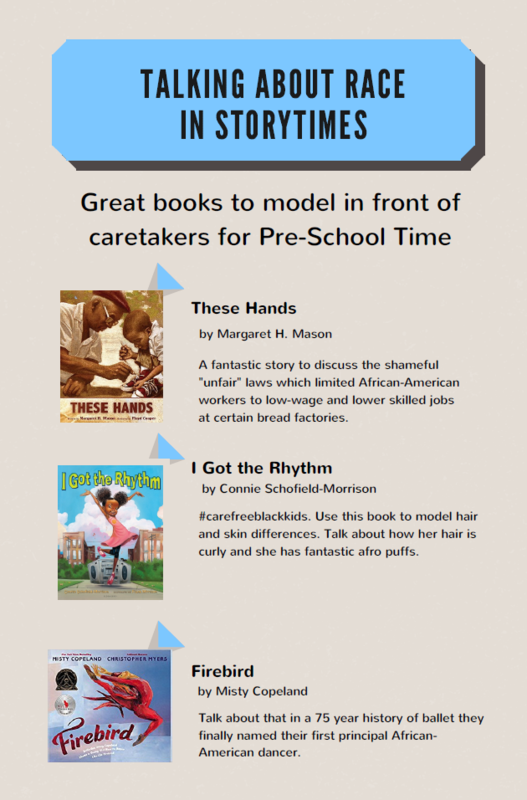 I did a webinar in January for Washington State Library about the toolkit I developed in providing caretakers with simple tools to start dealing with biases that develop at an early age. We as librarians have immense power in the way we prepare kids not only for early literacy, which translates to kindergarten readiness, but we also have power in how their social interactions with “others.” The library is free and open to the community which means we have the perfect opportunity to create inclusive environments where we are fostering appropriately aged dialogue about our humanity and legit science. Skin pigment is not a magical thing that just happens. I will give a few highlights from the webinar that I hope will challenge you to create a balance of not only whatever fun storytimes you want to do, but remembering that you have a chance to model inclusion and celebrate diversity in the books that you choose and the parent tips that you speak. The New York Times summed it up best when they wrote a recent article, “Black Kids Don’t Want to Read About Harriet Tubman All the Time.” Just like you would challenge gender roles, a book of all male inventors might make you uncomfortable. Women were inventors too! Well, race should be the same way. African-Americans are more than just entertainers, musicians, and civil rights activist. Are you portraying stories to your patrons of just regular black kids like Jabari Jumps by Gaia Cornwall or Max and the Tag Along Moon by Flyod Cooper or I Got the Rhythm by Connie Schofield-Morrison? Native Americans are still around today! Are you only reading books in your storytime that portray them in a certain historic era? The biggest issue is in how you model. We talk about storytime transitions. 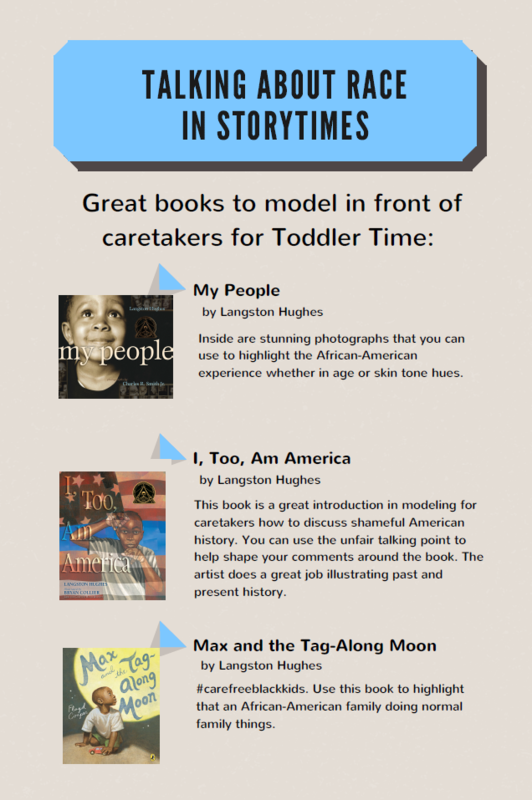 In those storytime transitions, early literacy educators have developed practical tips for caretakers to take from our storytimes to help encourage modeling at home. Raising socially conscious kids or just good citizens or empathetic people is the same way. You can bring up these points naturally—in a non preachy, non checklist way—or in an I’ve done my good storytime universe deed of the day. This also should not feel like OMG–ANOTHER THING TO REMEMBER. If it is detracting from your storytime rhythm you are not doing it right. I’m a black librarian and haven’t missed a beat when pointing out features to kids and I have observed my storytime instructors doing it as well. 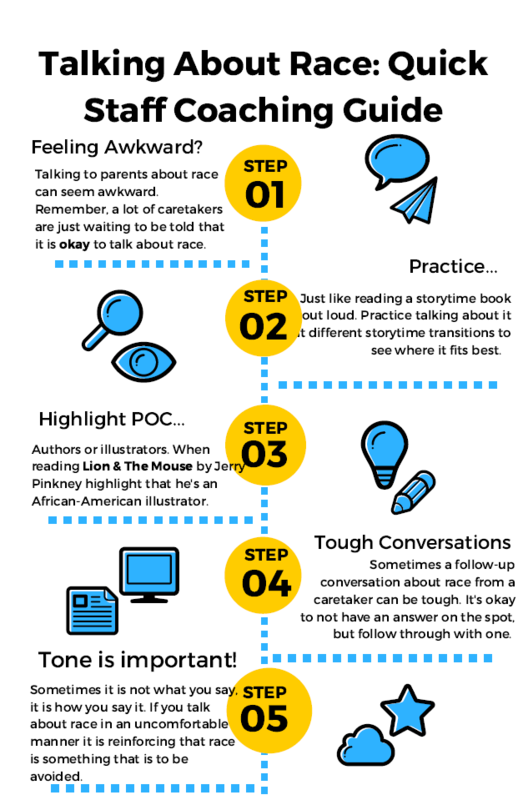 These two charts can be used to help staff start to think about how they can approach race in storytime. I hope that you can take this as a call to action in challenging yourself to add some solidarity work to your storytimes. I hope that we can be a better society. Fred Hampton said, “we can fight racism not with racism, but with solidarity.” Alex Haley said that “racism is taught and not an automatic behavior it is a learned behavior towards persons with dissimilar characteristics.” You do not have to embrace fear. Help empower families and children that they do not have to automatically learn to embrace ignorance and fear. Strengthen your knowledge on race and its negative impacts by getting a birds eye view on different past and present racial happenings. Other great starts are the books Tai-Nehisi Coates writes and this amazing article/thinkpiece on race from national book award winner Ibram Kendi. For intersectional feminism 101: Melissa Harris-Perry’s Sister Citizen: Shame, Stereotypes, and Black Women in America or Tamara Winfrey Harris’ The Sisters Are Alright: Changing the Broken Narrative of Black Women are great places to start. Remember when we put out a call for guest posts? It’s still open if anyone is interested in contributing! Today we are excited to share a guest post from Katie O’Brian. A native of the Chicago suburbs, Katie works as a Librarian at the Sam Gary Branch of the Denver Public Library. 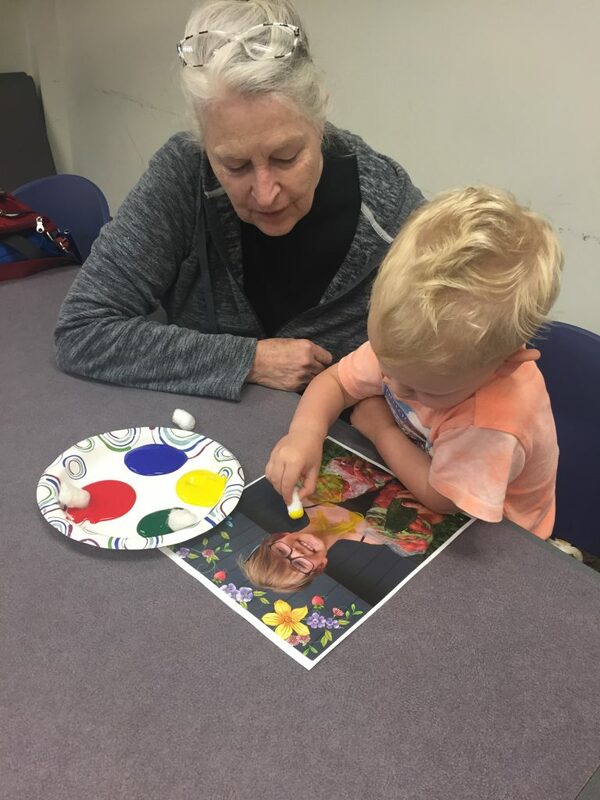 She has worked with children and families since 2012 and loves providing storytime and programs for children of all ages. In her free time, Katie reads, knits, and watches The Great British Bake Off. 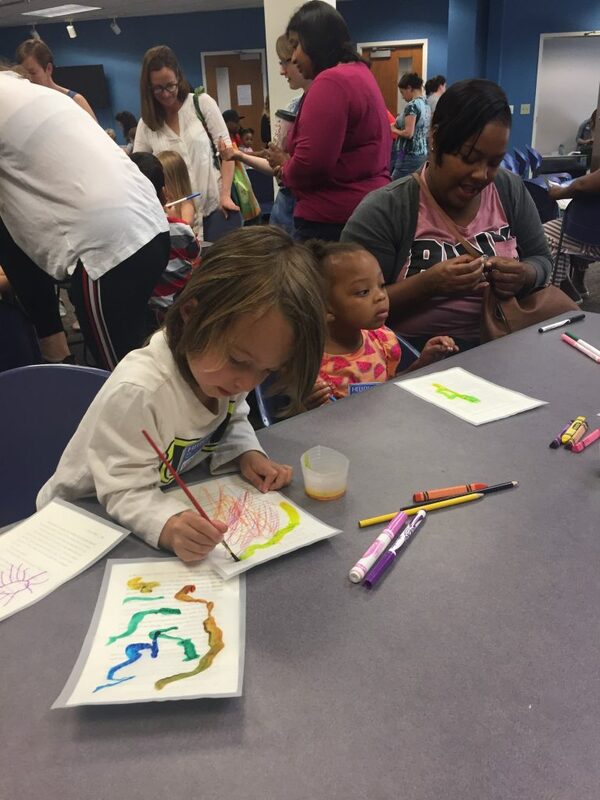 Read on to find out what process art is, why it’s great for kids, and ideas for trying it out at your library. Thank you, Katie, for this amazing post! I used to think that every craft program I ran had to have a specific product the kids could take home at the end of the day. I gathered all the right supplies, tried to guess the right numbers, and made sure directions were clear. While this kind of craft has its place, it’s certainly not the only option! You or volunteers could spend hours cutting out tiny pieces to make a very specific product. Alternatively, you could put out a variety of supplies and watch what happens. This is called process art, and it’s a magical thing. In process art, the emphasis is on exploration. 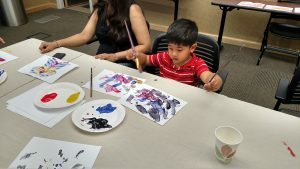 Participants explore a material, a technique, a color, etc. at length. There is no sample to follow. The activity is child focused and directed. The goal might be to explore painting, for example, by using a water bottle as a kind of stamp. Do we roll it? Stamp with the bottom? The top? Inevitably, someone will decide they want to discard the water bottle and spread the paint with their hands or a brush. That’s great! They’re seeing what happens when all the colors are combined. They’re getting messy. They’re having fun! The developmental benefits of process art are numerous. 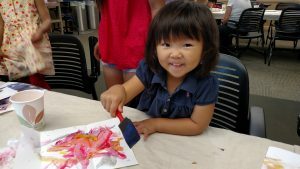 Because every child explores differently, process art allows each child to engage in self-directed learning. They have the control. When we ask a child, “What would happen if…” we’re asking them to answer an open-ended question. This is a powerful learning opportunity. 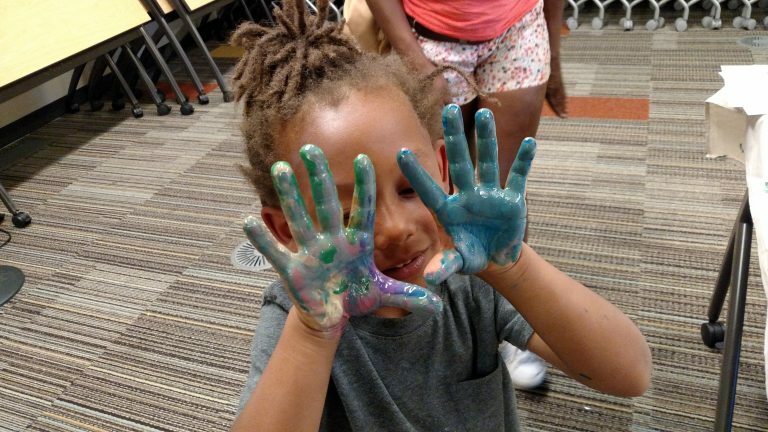 It gives kids a chance to be messy! 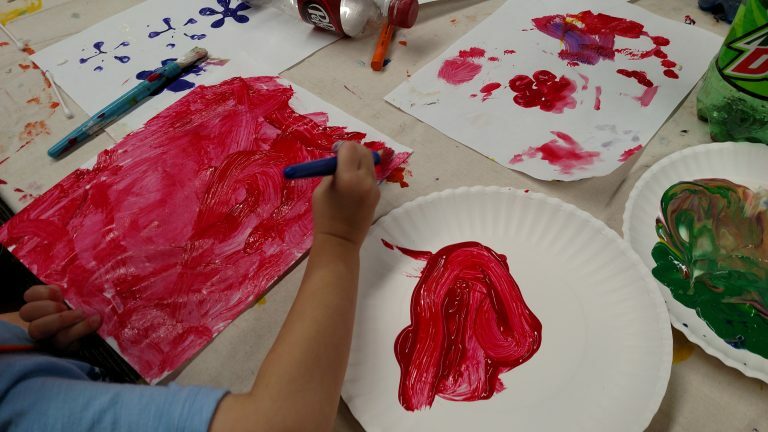 Multiple parents have told me that they would never let their kids paint at home because of the mess. They appreciate the chance to let their kids explore the art of mess making in an environment where they’re not responsible for cleanup. For those of us who are responsible for the cleanup, I advise using dropcloths or some other kind of table cover. Limit the amount of supplies you put out at once. If using paint, I squirt a color or two onto a paper plate and refresh as needed. Inevitably, someone paints on the plate, but that’s part of the process, too! If we’re painting with watered down glue or liquid starch, I put a limited amount in a cup. I have been fortunate to have access to multi-purpose rooms with sinks, but if you don’t have access to a sink, try filling a basin with water and bringing it into the room. Wet wipes are also super helpful. If you’re hesitant to do an entire program around a process-based craft, it’s also quite easy to incorporate into something else. Planning a big event with several stations? Maybe put out a bunch of materials at one station and let kids go to town! Don’t really have a lot of time for a whole program? 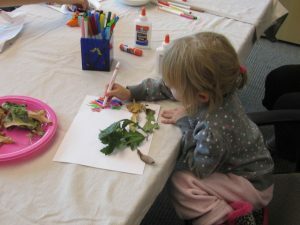 You can also incorporate process art into passive programs like make and take crafts. 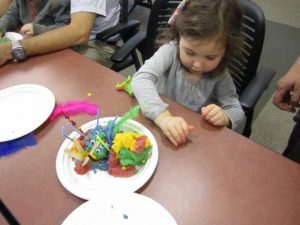 Exploration and process-based learning are important for older kids, as well. 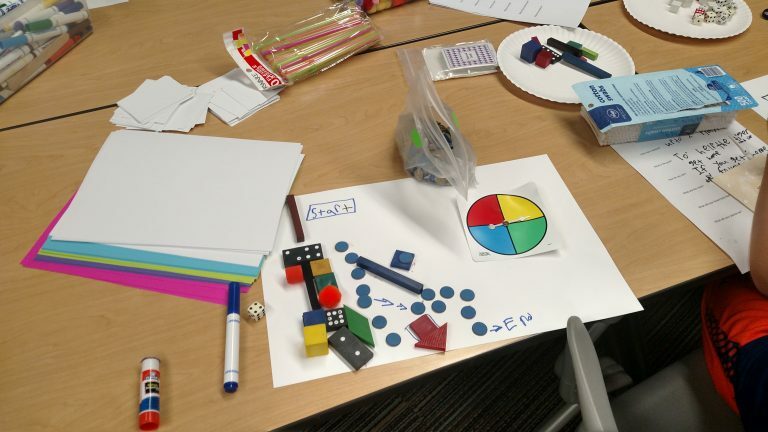 I did a DIY Board Game program for families with kids of all ages. I was interested to see how the process might change as kids got older. I provided a list of questions to consider in case kids needed more guidance. Among other questions, it asked, “How many players?” “What is the goal?” “How do you win?” Some kids methodically answered every question. Others ignored it completely. Some had very involved sets of rules. Others focused on the design of their game board. It was really cool to see individual personalities come out in the process of board game design. One girl, with her arm in a cast, made a game called “Hospital” in which the goal was to get to the patient’s room first. Real life inspires art, perhaps? Do you have any favorite process-based crafts or programs you’ve done or recommend? I’d love to hear about them! Way back in February we celebrated International Mother Language Day round these parts. And because I work at a branch that has materials for kids in six different languages I felt it was my duty to try out some of these languages in storytime. Now it’s May which means February was basically last week and I’m finally getting around to writing it up. I thought it might be more useful to talk about how I went about planning it rather than just tell you all what I did, hope you agree! (Though if you’re all about the storytime outline our pal Danielle and her colleague Shanshan Hui published an awesome Mandarin/English storytime in Winter 2013 YAACing.) Still with me? Ok, onto the planning! If you are like us, you may have noticed a growing interest from families in using sign language, especially when it comes to storytime. What’s it all about? And how can you learn more? Sit back and enjoy some resources courtesy of our amazing Twitter pals and then we’ll share some of our videos which incorporate American Sign Language. 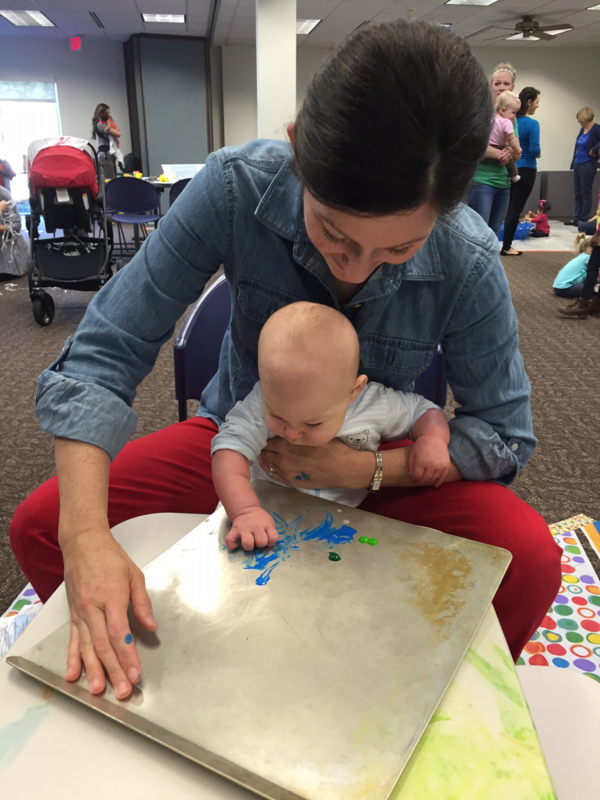 First up, check out Renee Grassi’s fantastic post on the ALSC Blog all about American Sign Language (ASL) in Your Library. Renee explains that ASL is “a completely separate and distinct language from English” and details ways in which libraries can better serve patrons for whom American Sign Language is a first language or those who are looking to try it as a second or third language. She includes a great list of resources from American Sign Language experts as well as youth services librarians who have incorporated ASL into their programs. Kathy MacMillan is someone else who has written (and presented!) extensively about American Sign Language and because she also wears a Librarian Hat, how it can be used in library programming. Her presentation Liven Up Baby and Toddler Storytimes with Sign Language can be viewed on Slideshare from the comfort of your couch, and provides background on American Sign Language, Deaf Culture as well as practical tips on using ASL in a range of programs. 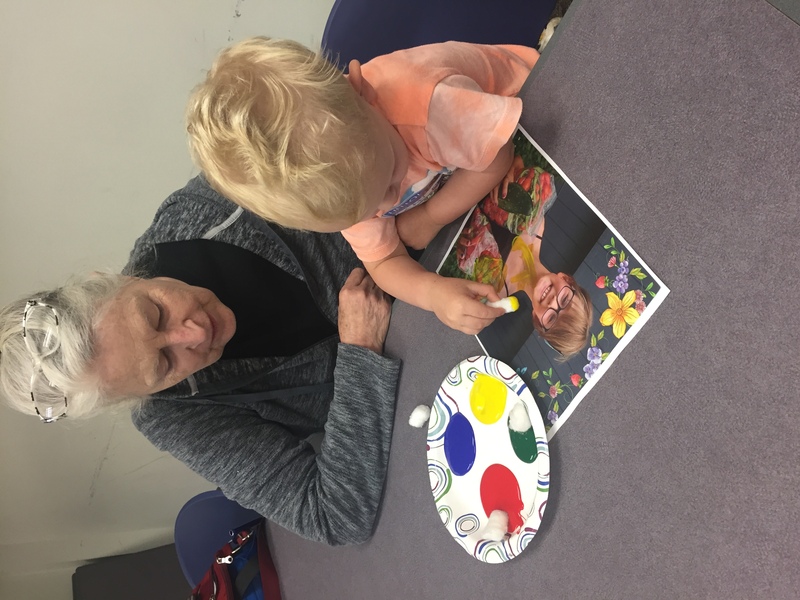 Finally, the great Tess Prendergast of Inclusive Early Literacy pointed us to PrAACtical AAC’s post on 10 Interesting Resources for Learning to Sign. It is a tech-licious list of apps and sites to help young and old learn to sign.